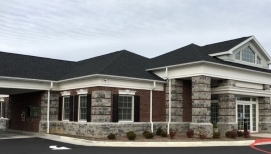 F&M first opened its doors in Timberville in 1908 and we remain the oldest bank with origins in Rockingham County. We are a true community bank that serves the people and businesses of Timberville. We are a convenient stop in the midst of your busy day. Parking is available, and we have a side drive-thru and 24-hour ATM for your convenience. As part of the Timberville community for over a century, F&M understands the importance of small businesses to a thriving town and economy. That’s why we are proud to support Timberville’s small business owners through our Perks @Work program, which helps businesses provide savings and discounts to their employees, and connect with potential customers. F&M’s employees also volunteer time and money to local causes through many initiatives including our “Casual Fridays for Charity,” which benefits different organizations each month. As an example of the F&M spirit, some of our employees spontaneously organized a potluck fundraiser to help care for a feline family found living on bank property. When you open an account with F&M you get the same services and convenience offered by national banks, plus extra perks that are rare in today’s banking environment. But what truly distinguishes us as a community bank is our personalized, professional service. Our knowledgeable employees are ready to help you find the financial products and solutions that will best serve your individual goals. F&M Bank Corp., our parent company, has ranked 4th out of 13 Virginia banks on the American Banker’s top 200 list of publicly traded community banks. Discover the responsive and reliable service that only a progressive community bank can provide. Are you looking for a bank in Timberville? Call us or stop by to meet our friendly team.